The well-worn Isuzu Rodeo came to a sudden halt in front of the mural being painted on the facade of Kiddy Skateland. Shout-outs like this have become routine for Tingley, a muralist who has been painting outside 33 E. Ferry St., two blocks east of Main Street, for almost a month. While the mural looks like a new beginning for the skating rink, it also marks the end of the Ferry Street Corridor Project, the yearlong educational and public art project that began with a goal of uniting Buffalo’s east and west sides. Most of the project was purposely centered just east of Main Street, long seen as a racial dividing line between Buffalo’s predominantly white and black neighborhoods. 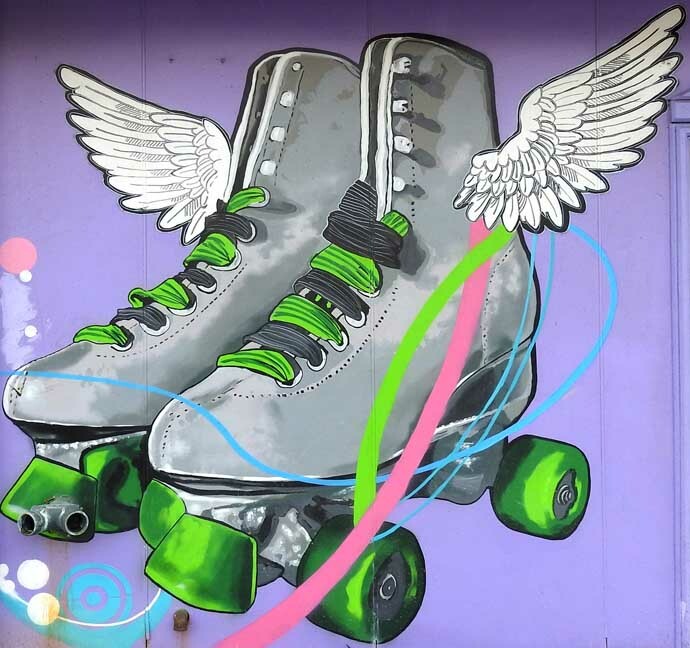 The nearly finished mural features four pairs of skaters, and a pair of roller skates with wings accented in neon green. The images, on freshly painted purple walls, include festive streamers and floating circles, which offer a slightly 3-D effect. 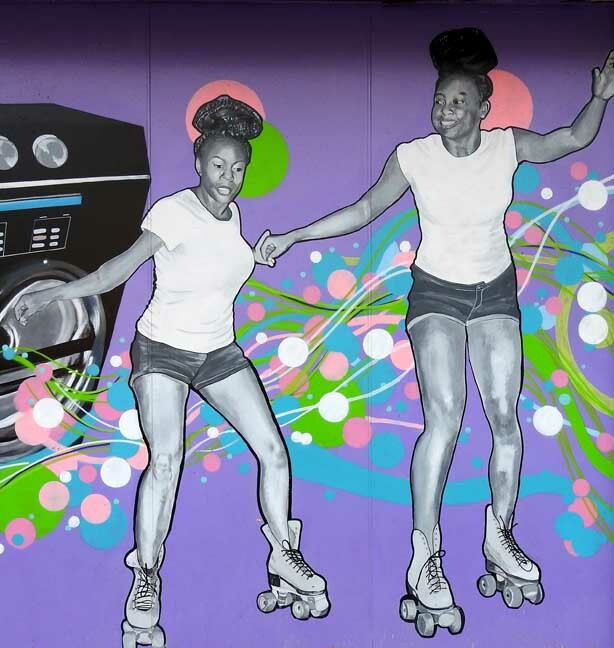 Against that backdrop, Tingley drew a big boombox next to two black sisters in matching clothes, their hair up, dancing on skates. 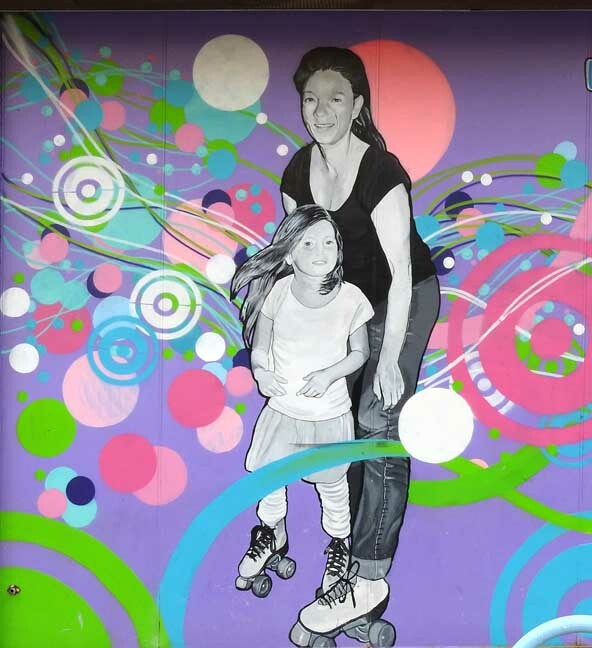 On the other side of the front doors are a mother and daughter, who are white, on skates and looking straight ahead. So are two Arab women in the next panel, their heads covered as they flash peace signs. Next to them are a white man and a black girl, skating away. 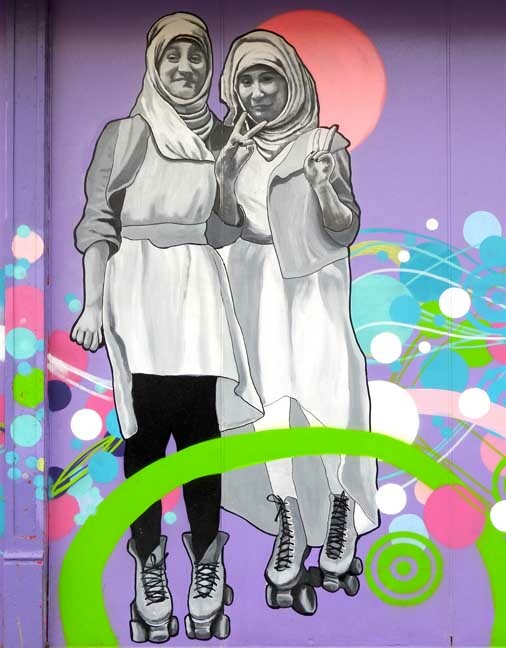 Tingley drew the images of actual skaters – selected from photographs taken at Kiddy Skateland – to reflect the diversity there. 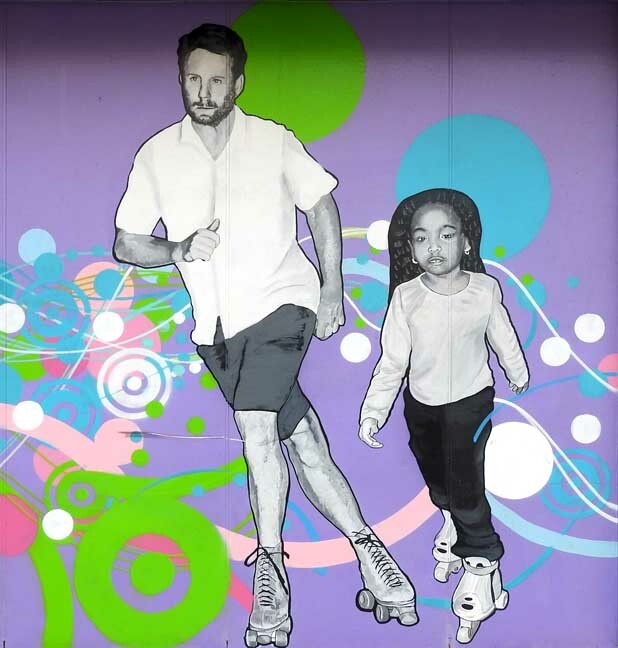 “Skating is a fascinating activity, an old activity,” said Barrett Gordon, an avid skater whose skate parties at the rink evolved into an integral part of the project. 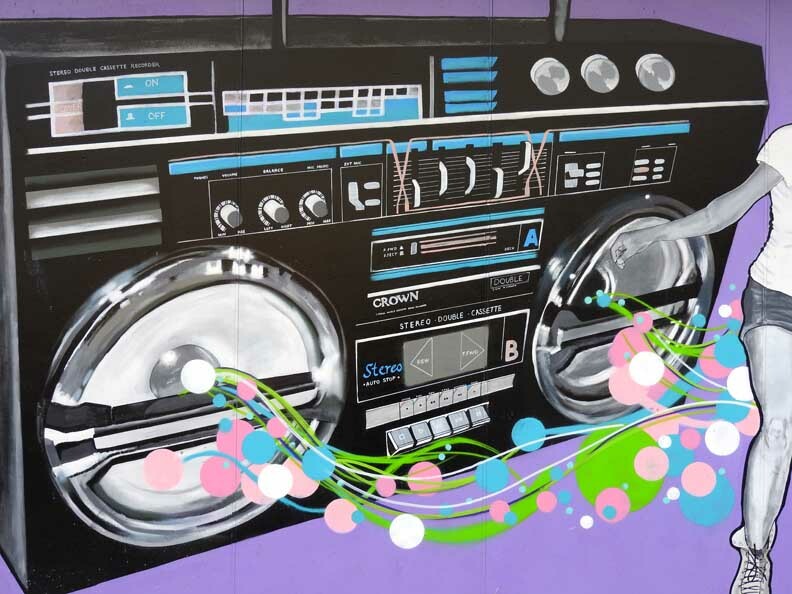 His work with the project also included producing a mural with community youth on the outside of the WASH Project, a West Side laundromat. “Skating is also a vehicle for bringing people together across generations, and across races and religions,” he said. Plans for the mural began in June. They had to mesh with Kiddy Skateland’s wildly colorful palette of lime green, purple, raspberry and vanilla, along with an awning of yellow and red and two multi-colored signs. Armed with a sketch design, Tingley used a projector at night to trace the skaters’ outlines. He used reference photos in the daylight to draw and paint the images, which slowly sprang to life. Community residents were invited on a Sunday to help paint background imagery. Tingley used acrylic paint and spray paint, and paint markers that produce spray paint in marker form. The [Ferry Street Corridor] project began a year ago, with teaching artists showing students how to paint and do portraiture at Buffalo Academy for Visual and Performing Arts on the East Side and Lafayette High School on the West Side. There were also summer programs. Funding came from the National Endowment for the Arts, and later the Community Foundation for Greater Buffalo and Open Buffalo.